Post-ACL weekend and Pre-OU/Texas weekend caused for catching up and keeping up. It was a short week so it went by fast. I headed home Thursday night instead of going straight to Dallas because big sis Kathleen got ENGAGED!! We are all so excited! Mom and Dad and I woke up early the next morning to head to D-town. Before meeting up with my friends, I held back to make a stop at Zara (holy amazing right now). While we were there I got an email that my ACL food article was now live on Spoon University. I had been working the past few days on getting it published and it was so fun to see it up on the main site! Spoon University is a website for college foodies. They cover everything from hot local restaurants and dining hall hacks to two-ingredient treats and tips on avoiding hangovers. Spoon is made up of student contributors across the country. They have individual college pages and a national page. Read my Eating My Way Through ACL post here! -Roasted corn, peas, brussels sprouts and butternut squash topped with a dollop of pesto and greek yogurt. I'm a huge frozen vegetable fan, so I use this method all the time to cook up a quick dinner or lunch. -A pink smoothie before all the carbs and fried food during OU/Texas weekend. Beets and strawberries gave it that pretty pink color! -The first Tucker sister is finally ENGAGED! Congrats Kathleen and John! I can't wait to co-wedding plan;) We were so excited we had to get froyo to celebrate! -Finally in Texas for the weekend and since the game is played at the fair you can't go through the day without getting a Fletcher's corny dog. 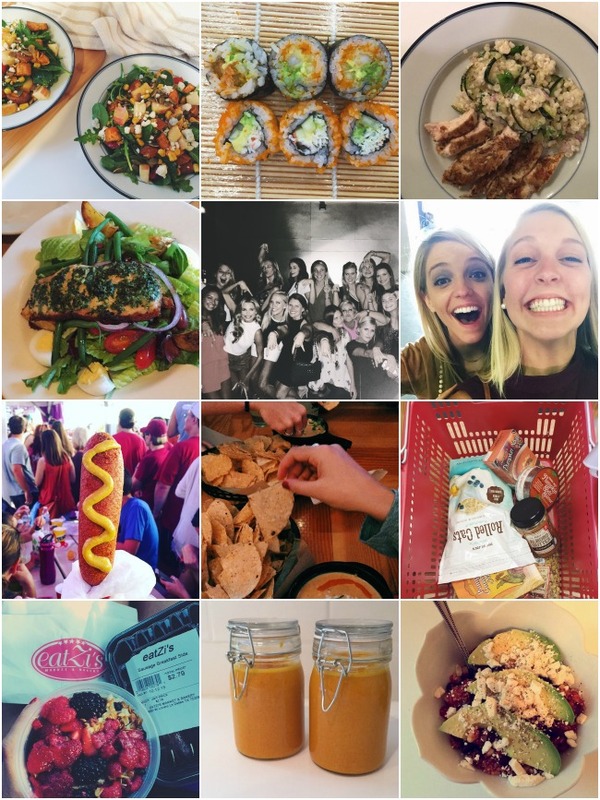 I seem to be a creature of habit because I have almost identical Instagrams from this year and last. -The crazy fried food ideas they come up with never size to amaze me. I saw a guy order the Fried Frito Chili Pie, and I couldn't help but ask if I could snap a pic. I actually think that sounds amazing, the guy thought it was sub par. -My annual fried fair food purchase is the Fried Pumpkin Pie. Inside is pumpkin, cream cheese & pumpkin seasoning, sandwiched between two ginger spice cookies, dipped in funnel cake, batter rolled in a mixture of ground cookies, powder sugar & pumpkin seasoning, then served with fresh whipped cream. I swear by it and it made it on Thrillist's, Best Fair Food at the Texas State Fair. -My last OU/Texas weekend as a student was as perfect as can be! An OU win helped too! -A Texas shape and sized waffle to send us off back to Oklahoma Sunday morning. -Detox time round two after two foodie weekends. Quinoa fried rice for dinner and green smoothies for breakfast this morning. I'm southbound I-35, heading to Texas for the second weekend in a row. This time I'm stopping in Dallas for the annual Red River Rivalry game, OU vs. Texas. Being a sooner, this weekend is very important. We have Friday off of school so that we can pack the Cotton Bowl with as many of us as possible. OU and Texas will go head to head on Saturday. I'll be at the game, but I'll also be going head to head with Dallas shopping, nights out with friends and squishing six girls into one hotel room. Bring on the long weekend round two. Texas we are comin' for ya again.